This is the Commander Report for today. Today the crew had a lot of personal interaction with good and fun moments. We found a board game that some previous Crew maybe left in the Martian habitat. It was about asking questions about personal aspects to understand each other more. Even though we known each other from a long time ago, we learned many new things from ourselves and now we understood many other things. Tomorrow we will go out to make our first EVA for the experiments. I’m sure the team will do a great job. When I found out that I would return to Mars the same year, the first thing I did was get excited by the new propulsion system that would quickly bring me back to the red planet after having visited it for the first time at the beginning of the year with a crew that represented all of Latin America. This new occasion is different, Misión de Exploración-1(MEx-1) is confirmed by Mexican engineers who have dedicated years of their life to work in different areas of science and technology in our country. We met more than two years ago in a congress of the International Astronautical Federation. There we knew that we all shared the same dream, being astronauts … going to Mars. Here we are, Here I am, in the front of a crew formed by leaders in their field but committed with the objective of the mission. Each of them has different personalities that make them unique and different for their tasks, experiments, and daily activities. I am the only woman, the youngest and the Commander. For all those girls who read this: come on, you can do it, don´t be afraid. Before coming to Mars, we trained for hours about how to work as a team and to learn how to solve problems and emergencies. All this worked because despite that they are still learning how everything works, each one has done a good job and fulfilled the tasks that are assigned to them. Thanks to our Ground Crew for the previous support. The mission has many objectives and experiments but I trust in my crew and they trust in me. Everything goes according to plan and without any incident. In the next few days we will receive a rocket with some more instruments for the experiments, meanwhile, we will perform other previous tasks. Another mission is over. Three crew members will carry on an extended mission for a few days. Short missions have different challenges compared to longer missions. Here, adaption to this environment is predominant to the effects induced by isolation, as more time is needed to manifest such effects in the crew dynamics. However, you can still get science out of it! An example. The leadership approach is completely different. My crew has interestingly connected their projects where energy is the main topic. During this week, we have investigated energy in engineering, science, agriculture and arts! Then, active conversations about the future of space exploration started when answering to kid’s questions about space. From one of this questions, it appears that a few kids think that only men can be trained as astronauts. I do not blame them, I guess it depends on the family. I recognize the importance of out-reach and STEAM in education. However, parents or relatives should also be educated to recognize the current progress of science, otherwise all the investments in STEAM might not have a long-term impact in our society. An example. Female astronauts exist. Female Commanders too! A good change can be produced investing in programs that teach to men how to work with women and vice-versa. Reminding the importance of women in our society is a bit limited, as it does not directly imply that a good interaction between employees or collaborators can be established. Wishing the best to all, especially new mothers. It’s been a beautiful sol on Mars today. With our EVA’s completing as planned, the crew cleans up to leave no trace and packs for home with mixed feelings. It’s been a successful mission, our research and exploration went as planned and have been fruitful. The crew has maintained a fine balance of work hard and play hard. Every one played their role to the T. As is bound to happen with a crew of highly accomplished individuals, we have been successful at mitigating minor ups and downs in crew dynamics through open discussions at our debriefing meetings. We have in fact used them to develop our strengths, work on our weaknesses and evolve as individuals as well as a team. This has been my second time commanding a mission. It has been a similar yet different experience; I have been able to apply lessons learned from the previous mission to this mission and I have had an opportunity to evolve my leadership skills while adapting to newer and different situations. It’s been a privilege to serve as Commander to this stellar crew. 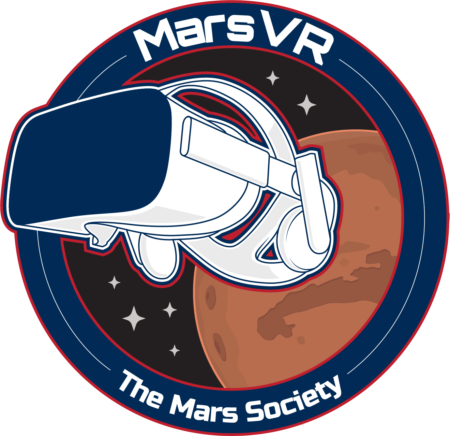 Looking forward to continuing our work to advance Mars colonization and space exploration together, beyond this mission. With all our goals accomplished we bring this mission to a successful completion! Thank you for all your support and for being with us every sol Mission Support and Mission Control! It’s been great working with you. With only a day left in our mission, we are a bit disappointed we missed the opportunity for our exploration EVA’s two days in a row. We hope to make the best of our EVA window tomorrow. Weather on Mars has been unpredictable, keeping us inbound for an entire sol. We had some interstellar visitors today, a group of young, future space explorers. 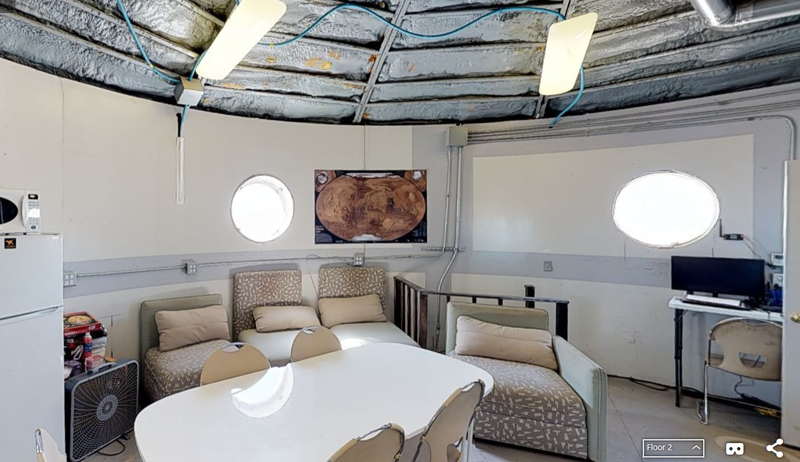 Our sol was spent interacting with them, giving them a tour of the Mars Desert Research Station facilities here and addressing their curiosities about space travel and living on Mars. Instilling inspiration and arousing curiosity in young minds is a mission all astronauts love, so it was a great experience enjoyed by the crew and our visitors. As we approach our last sol on Mars, we work on summarizing all the work that we have done during this mission and look forward to making the best of our last sol here on Mars tomorrow. For now, we spend a relaxed evening enjoying a Thai style dinner and maybe catching up on our last movie on Mars. Sols fly by on Mars! Before we knew it, we are at the half-way point in our mission. We took the time today to ponder over what we have accomplished so far and plan the rest of our mission. It being a rest day, we decided to put it to good use and spent the morning creating outreach videos. Followed it up with a lunch of quinoa, chicken curry and daal. Our CGA captured a beautiful view of the prominence on the southeast side of the Sun! Cannot wait to take a look at the processed image. Our CE and HSO spent early afternoon putting together the new red wagon as requested by Mission Control. We plan on taking it easy the rest of the evening. We’ve been learning the American Sign Language from our CGA (who’s hearing impaired), will dedicate some time this evening for the same, a round of "Never Ever Have I" game is on the cards after and might wrap up our evening with a movie, Hidden Figures Or Interstellar. Both interesting. Let’s see what the crew is in mood for. Thank you for being with us this evening Mission Support! Signing off for this Sol! Its a beautiful feeling to be on Mars. We have made a home away from home here and are starting to make a special bond with this red planet. We have adapted to this new routine, with our Executive Officer and Health Science Officer setting of on their morning EVA, while Crew Engineer, Crew Geologist and Astronomer and me working around the hab in the greenhouse, musk observatory and on hab maintenance. The plants in the greenhouse are doing great, we harvested fresh greens today to make salad, soup and to add flavor to our pizzas. 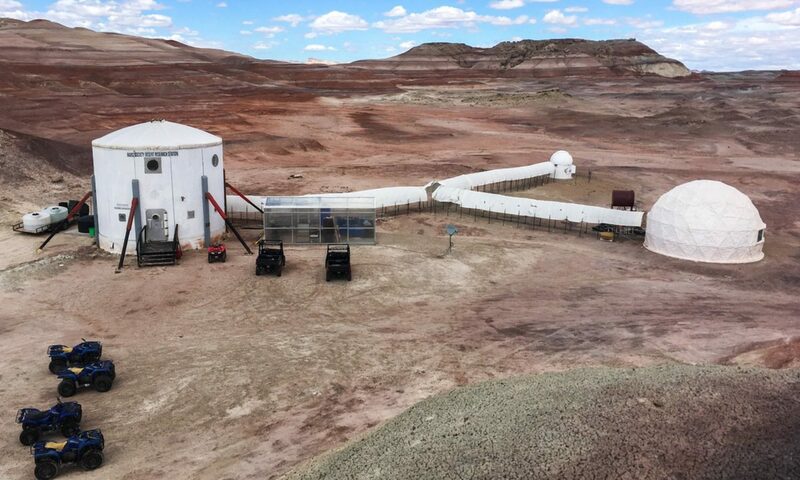 While our CE has been doing a great job of maintaining the hab and the vehicles, our CGA has been impressive with his work in the observatory. The afternoon EVA turned into another adventure when we couldn’t find a road mapped by rovers and previous crews, as it was stormed out and there was no trace left of it. We resorted to the map and GPS coordinates, used our navigational skills and tracked it down. Our efforts were paid off when we reached the canyons at Candor Chasma and were treated to beautiful views. We scouted for emergency shelters, but all that terrain is really flat to have any possibility of emergency shelters, unless we hike down into the canyons. We have left signs to mark part of the road that was washed off, so that future crews are able to find it. We have had a really busy week so far. Our research projects are coming along great and am happy with the progress we are making. Planning on winding down the next couple of days as the weather is predicted to be extreme. Will spend time on some team trainings, hab projects and planning for the next week. The team is in great health and spirits and looking forward to the next few days of adventures, research and exploration. I am impressed with the camaraderie and team spirit each crew member has exhibited. Proud to be a part of this crew. Woke up to a beautiful Martian morning! Weather on Mars has been beautiful boosting the crew’s exploratory spirits! After a quick breakfast our first EVA crew, our XO and HSO set on to explore the southern sites of Phobos Peak and Kissing Camel ridge. The crew that stayed back worked on engineering (CE), astronomy (CGA) and greenhab (CO). The crew enjoyed a scrumptious lunch of Thai green vegetable curry and chicken curry with brown rice. It was refreshing to have fresh green bell peppers and tomatoes from our greenhab while cooking those curries! The afternoon EVA was adventurous as we, the CE, CGA and me, set out to first locate the shelter the previous crew had marked. We then headed to the Tank Wash area where amongst small canyons, river beds and stream beds we found 2 caves big enough to house 7 to 8 people during an emergency evacuation or to take shelter during storms. The coordinates for the cave that we think is an ideal emergency shelter are (0518913, 4252915). We worked in the RAM for the rest of our EVA on the new MDRS signpost project. The challenge in this EVA was the lack of means to communicate with our CGA who is hearing impaired. His beartooth device malfunctioned. We got creative and used sign language plus typing text in my phone to communicate with him. I feel content knowing we have been able to work around issues, involve him in our EVA’s and he is having as much adventure and fun while working on research and exploration during the EVA’s. Our CE and I spent some time planning the new MDRS signpost project, we plan to do it in stages. We are making good progress on our science, gathering useful data. The crew is healthy and doing great! It has been amazing to see how the crew has been using their skills and expertise to work around problems, come up with unique solutions and make the best of every situation and available tools while working together as a team. Be it fixing and putting up the signpost during an EVA yesterday, or the emergency engineering EVA to secure the RAM for which our HSO volunteered to go in my place or the way she has been using the medical tools available to collect our health vitals before and after the EVA’s, or the way our CE found the GPS unit in the hab and got it working for our GPS Route Measurements project. I am proud to be a Commander of this stellar team! Thank you for being with us Mission Control (MDRS Director) and Mission Support! Appreciate it.